She has also authored a book on women entrepreneurs named “The Road Not Taken” published by IIM Bangalore. She was among the Top 10 women entrepreneurs by Tipping Point (Global Women Network and KarmaCircles initiative). She was the finalist and the only team from India to reach Hult Prize, San Francisco which is a Bill Clinton Initiative for social enterprises. 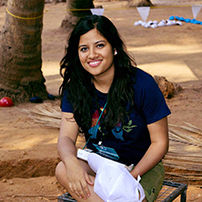 She is also the co-program leader at SLP(Startup Leadership Program) Bangalore. She is a Jagriti Yatra Fellow which is a 15-day long national train journey that covers 8000 kilometers to meet inspiring role models of India. she was also selected to attend UNCTAD’s Empretec Programme for India which promotes entrepreneurial competencies in start-ups. She was recently awarded by the Governor of Goa as part of Seaside Startup Summit and Cowe.